A 66 years old male patient, known to have hypertension showed up with a painless lump in the right hemiscrotum that he has been suffering from since 3 years. He had no history of testicular trauma or infection or lower urinary tract symptoms. Examination showed a well-delimited mass of 5 cm, firm, non-mobile with irregular border over the right spermatic cord. All blood examinations were normal. The serum levels of alpha-fetoprotein, beta-hCG, lactate dehydrogenase were within the normal limits. The patient denied scrotal pain, hematuria, dysuria, fever or chills. 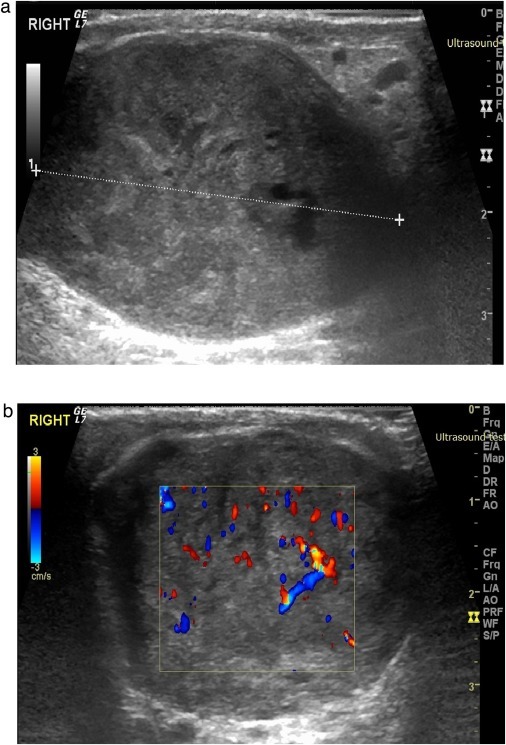 Ultrasound of the scrotum showed 4 × 3 × 4 cm, circumscribed heterogeneous solid extra-testicular mass located above the right testicle with increasing vascularity suggesting a neoplastic mass. The epididymis seems to be preserved, the right testicle shows homogeneous echo structure. CT-scan of chest, abdomen, and pelvis were negative for local or distant metastasis. Right radical orchidectomy along with excision of the spermatic cord mass was performed. During the surgery a mass is seen arising from the upper part of the cord while the testis and epididymis were separate from the lesion. 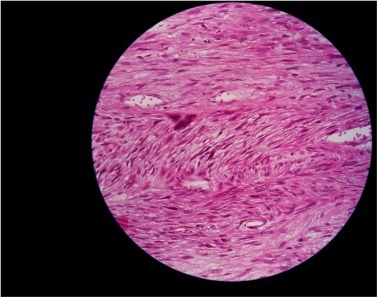 Microscopic examination of the well -delineated mass demonstrated fascicles of spindle cells with eosinophilic cytoplasm of probable smooth muscle origin. Focal areas with pleomorphic morphology and hypercellularity with two to three mitoses per high power field (2-3/HPF) are present. The immunohistochemistry tested positive for Vimentin and Actin. Definitive pathological diagnosis of this patient revealed a leiomyosarcoma of the right spermatic cord with negative surgical margins. The clinical and radiologic follow-up with thoraco-abdominopelvic CT for 6 and 12 months shows no signs of local recurrence and distant metastases.